Audrey Tilve:It’s still the dream to be a part of the European Union. That’s the case here in Albania, a Balkan country still linked to troubles, such as corruption and crime. But the socialist prime minister, Edi Rama, who has been in power for three years, is a reformer. His aim, to join the European club. But where does Albania stand now. That’s what we are going to try and find out right now . Edi Rama, thanks for coming. Audrey Tilve:We’ll start with the European Mission, since that’s your mantra. Albania has been a candidate since 2014. Since the beginning of the year you’ve been pushing hard to get accession talks started a quickly as possible. What is so attractive about the European Union when you can see the state that it is presently in? Edi Rama: “I think at home and in the Balkans, in general, we have not forgotten what is often forgotten in Europe, that the European Union, is above all, a project of peace and prosperity. “You must remember that for the first time in 68 years I went to Belgrade, and my Serbian counterpart came to Tirana for the first time in the history of two neighbouring countries that have waged war against one another. Audrey Tilve:And in a troubled European Union, what would be the point of welcoming Albania, which has even more problems? Edi Rama: “This is exactly the reasons Marine Le Pen and her allies in Europe have given. Audrey Tilve:Anyway, before you start membership talks, Brussels says you need a major overhaul of your judiciary system. Progress on this has been slow, notably because of conflict between your government and the opposition, which has slowed things down. How are you going to get yourself out of this tricky situation? 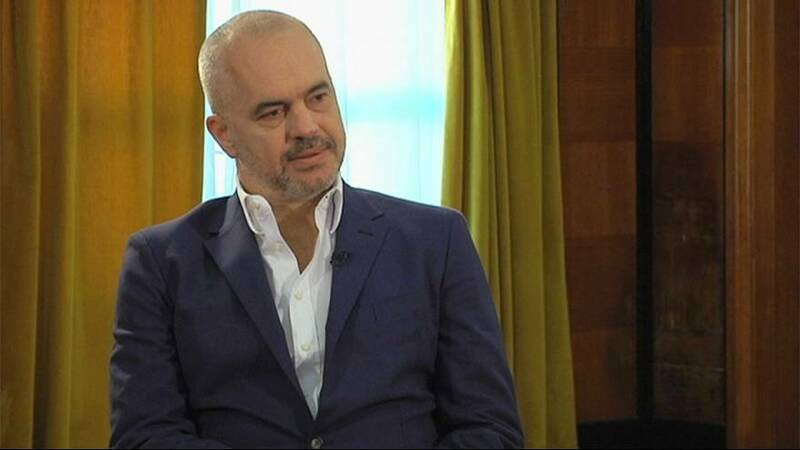 Edi Rama: “Reform won’t be a long time coming. We started on this road over a year ago and we in the process of wrapping up the loose ends. “It’s a fundamental and radical constitutional reform to completely change our judicial system. And, yes, it’s very very difficult. There are discussions, and there could be probably more. Audrey Tilve:What is the time frame? When would you like to adopt this reform? Edi Rama: “We, we want to open membership talks by the end of the year. There. Audrey Tilve:Albanian magistrates are not corrupt? Can you confirm this in front of everybody? Edi Rama: “We need to stop these stories of a corrupt and criminal Albania and of a corrupt and criminal Balkans. Audrey Tilve:According to Italian anti-mafia prosecutors and expert reports, about one-third of the Albanian economy is governed by crime of all types of trafficking. Drugs, arms trafficking, women, organs …? Audrey Tilve:What would you say? What are your figures? Do you deny the fact that there is illegal trafficking of drugs, weapons and women in Albania? Audrey Tilve:So, there are no problems with crime in Albania. All is good? Edi Rama: “Why do we need to go from one extreme to the other. I don’t understand it. Either there is no problem, or crime is everywhere. Why? Audrey Tilve:That’s not what I said. Edi Rama: “It’s a country that changes every day… with problems, with a very very difficult past … the most difficult of all the communist countries because we were cut off for from not only Eastern Europe but Western Europe for 50 years. Audrey Tilve:We are going to change the subject and talk about the economy that you are trying to develop and boost. Foreign investments are rising, however, the country produces very little and imports a lot of goods. What sector has the potential for the future? Edi Rama: “Well, Albania is rich in natural resources, oil, gas, minerals. Albania’s tourism industry has amazing potential. We can develop a competitive agriculture sector to provide enough for our needs. Audrey Tilve:We are going to finish on a more personal note. Before entering politics, you were an artist, a painter. Looking back, do you regret leaving the arts world? Edi Rama “Me, I never regret anything. I had other plans, but there you are, I’m here now, in front of you. And I took on the great responsibility of leading my country. And it’s the biggest privilege and honour that one can have. “But at the same time I haven’t given up my work as an artist. I am an artist at the same time as I am prime minister. I paint during meetings, I paint during calls. Audrey Tilve:Edi Rama Thank you.